Group News Blog: Cary Tennis: Should we euthanize the Yorkie? Cary Tennis: Should we euthanize the Yorkie? Making fun of Cary is a tradition from The News Blog I hesitated about bringing over. First, it's kind of like shooting fish in a barrel. Second, Cary kept getting better, starting to refer the obviously really messed up people to therapists. I am stressed and wrestling with an ethical dilemma: Would it be right to put down the 11-year-old dog of my grandmother, who has middle-onset Alzheimer's disease? It's the eve of Thanksgiving and my grandparents are both here, with this dog, a tiny, whiny Yorkshire terrier who has learned to beg constantly. It's not her fault; my grandmother forgets that she has just fed her, hears her whine (oh the sound of that whine!) and gives her another largish helping of steak or chicken or cookies, or whatever anyone happens to be eating at the time. As a result, the dog is overweight, out of shape (she will not walk more than five feet before stopping and dragging her feet), largely incontinent (I just wiped up hot dog pee 10 minutes ago), and the most annoying creature on the planet. I mean, I don't have kids yet (I'm 24), but if this were my kid I would send it straight to boarding school. But that's what I'm writing to you about. This dog is seriously damaging the fragile universe of care my grandmother has -- its incontinence and whininess grate on my poor grandfather, along with the fact that my grandmother refuses to walk the dog or take it outside to go to the bathroom or clean up after it, so it all falls on him. It bothers my aunt, who is the primary caretaker of my grandmother, for mostly the same reasons. They get in screaming fights with my grandmother about it. I know it sounds horrid, but when you combine the stress of caring for an Alzheimer's patient with the stress of caring for a dog who is similarly incapable and needy/whiny, it breaks down the patience and reserve of even the most saintly. I love dogs, but find myself wanting to kick it. Anyway, there has been some talk of putting the dog down because it is old, incontinent and going blind, and more importantly is breaking down my grandfather's will to live (he's spoken about suicide multiple times) and ability to care for my grandmother. We are pretty sure she would forget about it after a week. No one has yet stepped up to the plate to follow through on this possibility. I'm thinking about it. What do you think? Is it the right or wrong thing to do? Could you live with yourself if you did something similar? Am I sounding as whiny as the dog? We cannot kill creatures in our care merely because their illness becomes a problem for the rest of us. We cannot kill the dog for this reason any more than we can kill your grandmother for this reason. Your grandmother and the Yorkie are both creatures in our care. They are not of the same species or the same status. One is a human and one is a dog. But they are both creatures and they both deserve to live. The Yorkie is overweight and annoying. So are many people we see in the supermarket. That does not mean we get to euthanize them. Hit the jump and read Cary's answer. Cary knocks it out of the park. He is precisely correct. We don't get to put down the Yorkie, just because it is fat and annoying and can't control its bowels. It is a living animal in our care. Unless it is in pain, we have an obligation to keep it alive. (If it is in pain, we have an obligation to give it a painless death.) And no... it truly doesn't matter how the obligation came to us; it is here. It is our obligation. Do I distinguish between an animal which has been under my care for a lifetime and is now ill, and new kittens? Yes. But we draw fine distinctions all the time. Drawing distinctions in language is that which separates us from other mammals. No one can doubt whales or dogs or even ants communicate. But to say they have language... no, we can not say that. They have behaviors and vocalizations or chemical or other signals which they use to communicate. These are different from a general purpose language which we can use to invent new words, which we then use to expand and extend the language itself, using language as our tool. Everything we distinguish, we distinguish in language. 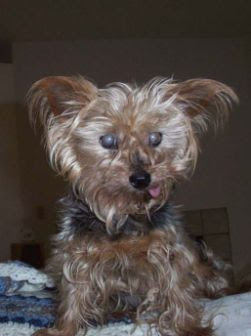 Including the Yorkie and its condition. That the Yorkie lacks language, makes him no less deserving of care. We have an obligation, and our acceptance or rejection of the obligation, determines who we are and the world we live in. What are we truly committed to? If it is respect for others, if it taking care of the poor and the least among us, if it is making certain everyone has enough to eat and a roof over their heads, truly... we can not put down the Yorkie. We must take care of everyone. At the end of every interaction, ask yourself, "Did I leave this person saying to themself reflexively, 'I was really taken care just now. They really took care of me.'" There is enough. It is a myth that there is not. We are enough, there is enough, and we have capacity and time enough to take care of everyone. This is not a zero-sum game, and don't ever let anyone tell you otherwise. With every act, with every communication, what world are you inventing?